A chip snack that’s high protein? Yup, it’s possible! 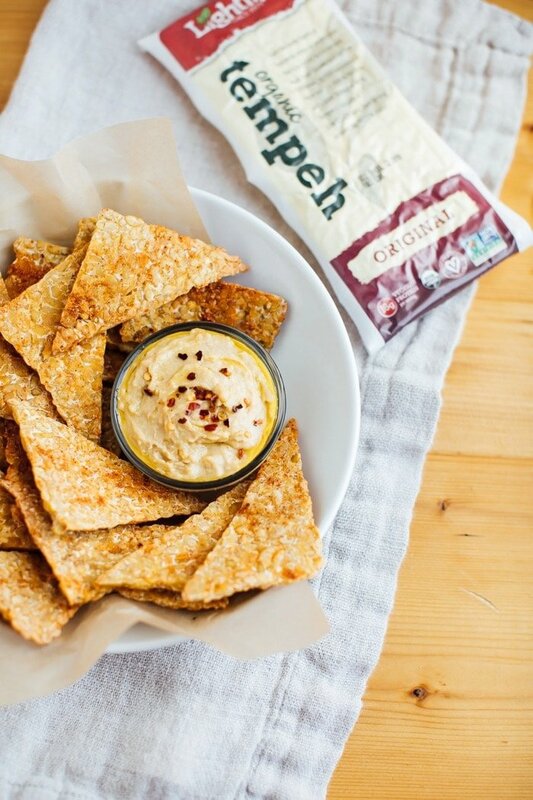 These BBQ baked tempeh chips are packed with plant-based protein and super satisfying. This post is sponsored by Lightlife. I ran my first race of the season this past weekend! I made a point to train for this one because I’ve admittedly shown up at the starting line for other races with zero training. Eep! Much smarter to train and feel ready to take on a long run. At this race, I loved the course, there were so many people cheering along the way and the weather couldn’t have been more perfect. Thank you for your support leading up to this! After the race on Saturday, I felt like I was bottomless the rest of the weekend. Do you ever get in those snacking phases where you just can’t stop?! Usually when I realize I’m in that “mode,” it turns out I’m not balancing out my snacks and meals. For me to feel satisfied, I need to make sure I’m getting a mixture of protein and fat along with lots of healthy fiber. I typically find that when I’m in bottomless pit mode, most of my snacks are carb focused. There’s nothing wrong with carbs, I just need a little more protein to satisfy my hunger! By now, you probably know I’m tempeh obsessed. I love making it for breakfast, for lunch and for dinner, but to be honest, I’ve never thought of it as a snack food. Until now! I mean it’s brilliant — tempeh is naturally high in protein and fermented, so this delicious snack will leave your taste buds and your belly satisfied. 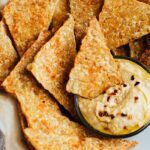 These BBQ baked tempeh chips are packed with flavor and are SO easy to whip up for a quick crispy, salty snack! While testing this recipe I made a ton of different flavors but the two I liked best were the plain sea salt and the BBQ. Sea salt seemed a little too simple to post so I went with the BBQ. Any other BBQ chip lovers out there? I hope so! These chips have a flavorful coating of BBQ seasoning so you can totally munch on them plain, but they’re also delicious with different dipping sauces. 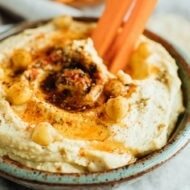 I recommend aioli, black bean dip, hummus, guacamole — I have no shame in my dip game! 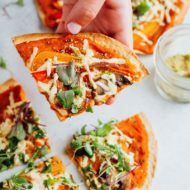 I used my favorite Lightlife tempeh for this recipe. I recommend the original or the three grain because the pieces hold together well, even when you chop the tempeh into thin slices. I tested the recipe with a few other varieties, but these worked best! 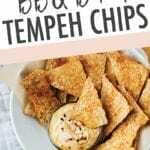 If you try this recipe for BBQ baked tempeh chips, please leave me a comment letting me know how they turned out and please leave a star rating as well. 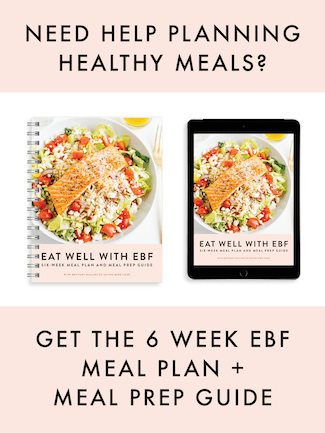 It’s super helpful for me and other readers! 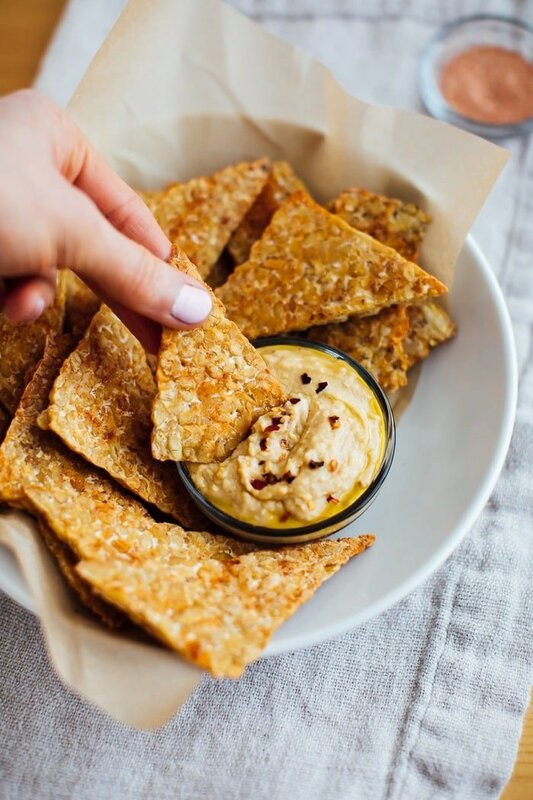 This baked chip recipe turns tempeh into a plant-based snack that’s loaded with protein and packed with BBQ flavor! Combine onion powder, garlic powder, paprika, sea salt and coconut sugar in a small bowl. 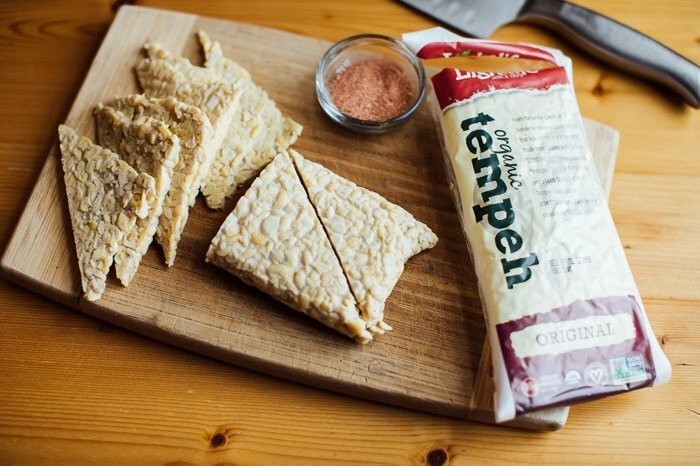 Cut block of tempeh in half, then cut each half diagonally so you have four triangles. Place triangles flat on your cutting board and thinly slice. Try to make your slices as even as possible. Place tempeh slices on a baking sheet and spray with cooking oil. Sprinkle half of the spice blend over the tempeh. Flip tempeh, spray with oil and sprinkle on the remaining spice blend. Bake for 10 minutes. Flip and bake for another 7-10 minutes or until tempeh is golden brown and crisp. Be sure to watch closely in the final few minutes because the tempeh can quickly go from golden brown to burnt. 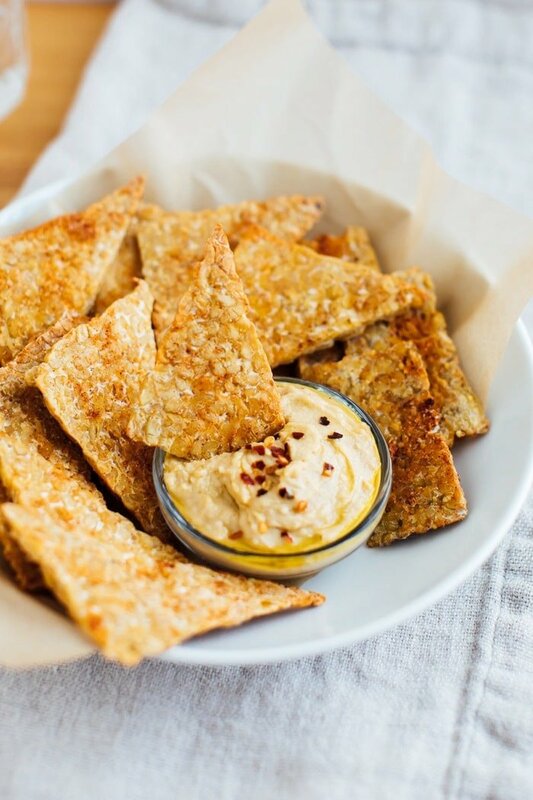 Enjoy plain as a snack or pair with your favorite dip. What a great idea! These look so good. This is BRILLIANT! 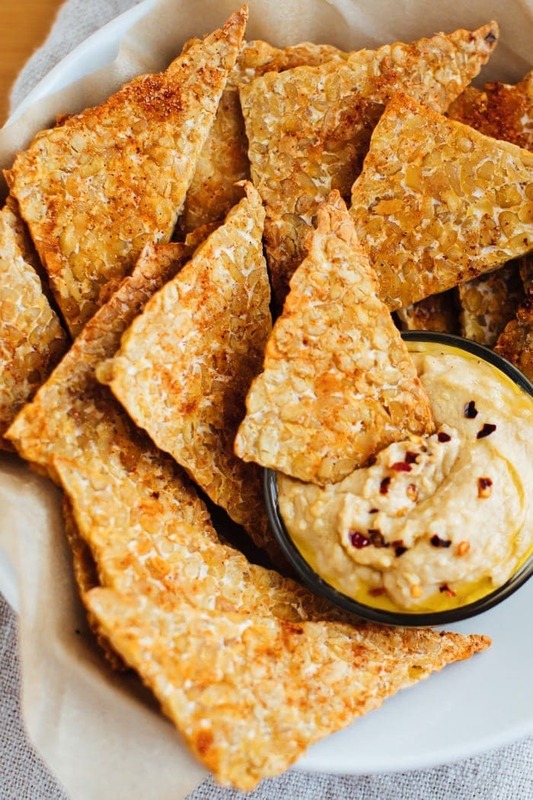 I love tempeh, and love the idea of making them into satisfying, crispy chips! What a great idea!! I can’t wait to try it! I’m the same way about snacks. I try to be purposefully and avoid the bottomless pit. What a fun way to use tempeh!!!!!! Nice recipe. Your BBQ chips looks so delicious that I can’t wait to prepare it as it is easy to prepare. 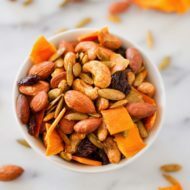 Thanks for sharing this amazing recipe as I can give it to my daughter as snacks. Keep posting such easy to make recipes. This is a great idea for a healthy snack. How should I store the left over?